In the last year or so many companies appeared and disappeared in the world of cloud mining and very few have managed to survive or turn out to be more than some quick scheme to trick the miners. One of the few cloud mining companies that remain and continue to operate is Bitcoin Cloud Services that is turning 1 year old on March 12th, though we started using it and did our first review of the service just about 8 months ago back in June last year. To celebrate their 1st year anniversary there is a currently ongoing price promotion for Bitcoin cloud hashrate being sold this hole week with discounts based on the amount of hashrate you purchase. The discounts listed below are applied automatically depending on the amount of GHS you buy, they are counted towards the standard price of 0.0017 BTC per GHS that the service has. The mining contracts are for 1 year with no additional fees, everything is included in the price of the hashrate you purchase, payouts are being sent on a daily basis. The service is keeping mostly anonymous profile does not reveal much about their actual mining operations, but the payout address is publicly available and you can check the payment transactions that go out. Due to the low Bitcoin price a lot of players have been left out and the Bitcoin cloud mining industry has been reorganized. Bitcoin is here to stay and Bitcoin Cloud Services mining operations will continue as the company has reassured us that they have secured hardware and energy agreements that will give a competitive advantage when the price of Bitcoin recovers. The last difficulty adjustment for Bitcoin brought a negative difficulty of -6.14% and this means more Bitcoin for the same hashing power and ROI in less time. However do not forget that investing in Bitcoin mining is something that is expected to give long term profitability. Over the course of the weekend Bitcoin Cloud Services is running a promotion with a 10% discount of the regular price of 0.0018 BTC per GHS for hashrate. All you need to do is to apply promo code BTC10OFF2015 during checkout to receive the 10% weekend promotion. Do note that this discount will be active only during the last weekend of the month, so make sure you don’t miss your chance to use it if you are buying Bitcoin cloud mining hashrate. 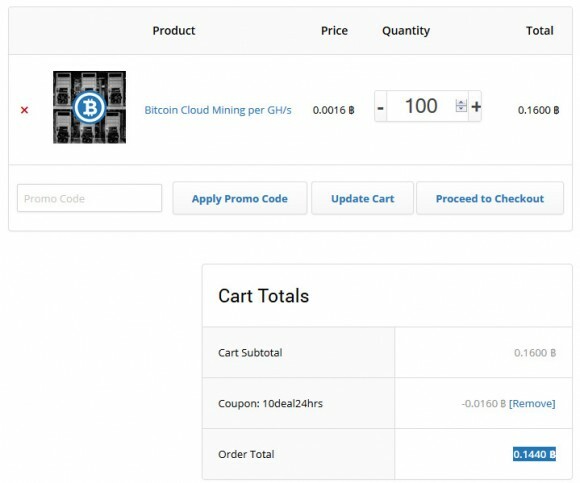 The cloud mining hashrate provider Bitcoin Cloud Services has just started a 24 hour promotion offering a 10% discount from the normal price of 0.0016 BTC per GHS (a very competitive price). In order to be able to purchase hashrate at 0.00144 BTC per GHS (10% lower price) you need to enter the discount code 10DEAL24HRS during the checkout. Do note that the minimum order you can currently make at the service is 100 GHS and that the promotion is going to be available for the next 24 hours only and payments are only accepted in Bitcoins. We’ve been testing and using the service for a few months already and so far had no notable problems with it and the payments you get are automatically executed on a daily basis.